Need to change your email? 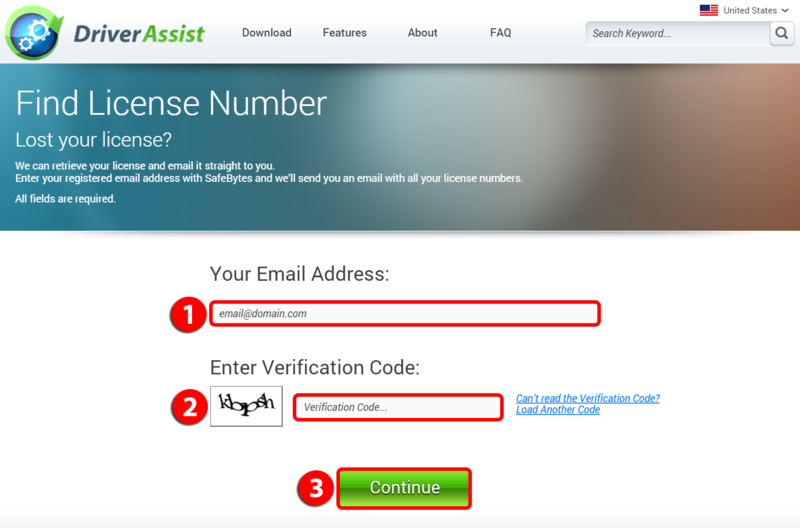 Can’t figure out how to renew your subscription or buy additional licenses? Check out the answers to our most common account and billing questions. 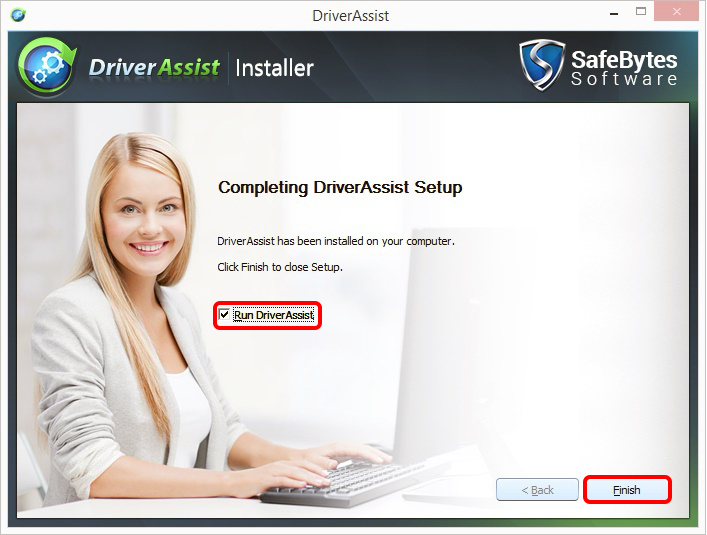 How Do I Install Driver Assist? 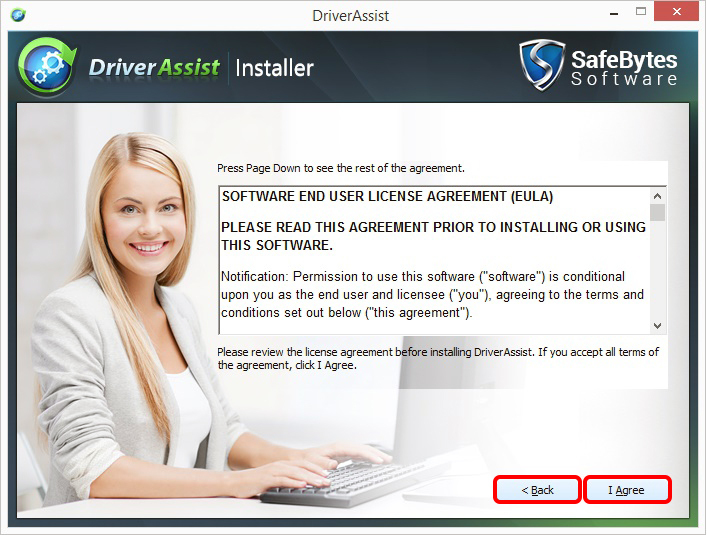 From main window, under the Download page, click on the green button Download Safebytes DriverAssist. When prompted, select Save File or Save to Disk option on the dialog box. Note down the location where the file is getting saved. Once download is complete, locate the downloaded file and double click it to initiate the installation procedure. Follow on-screen instructions to install Driver Assist: Click Next to continue. Read through the end user license agreement and then click I Agree to continue or click Back to go to the previous screen. Click Finish to complete the installation and start Driver Assist on your computer. How Do I Uninstall Driver Assist? Launch Driver Assist from the Start menu or Desktop shortcut. Once the main application screen is open, click the License (1) tab from the top menu pane. You should see the word Registered (2 & 3). The User ID (4) and License Key (5) will also be displayed on this page. Just below the key is the Expiry. The registered Name and Email (6) will be at the bottom left portion of the page. How Can I Purchase a Driver Assist License? 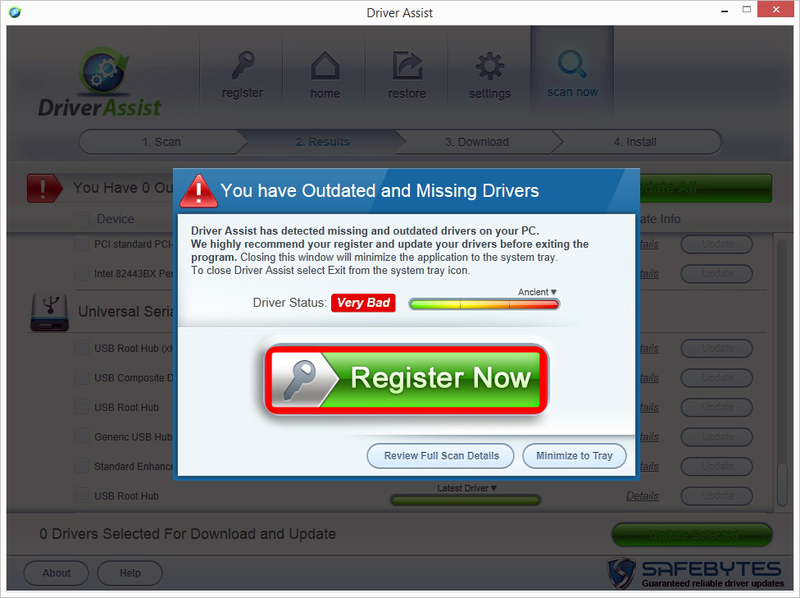 After installing Driver Assist, you will be prompted to scan your computer for driver errors followed by a prompt to register the software. Click on the green Register Now button. You should see a page asking you to fill-out a form: Full Name (1), Email (2) and Country (3). Only the first 2 are mandatory requirements. After that, just click on the green Activate Now button. Click the drop-down arrow (1) and choose your preferred subscription: Standard (6 Months) or Extended (1 Year). You also have the option to bundle it with Safebytes Anti-Virus by clicking on the tick-box (2). Lastly, choose your preferred payment method: Credit Card (3) or PayPal (4) to proceed with the purchase. Launch Driver Assist. Click on the Home tab then click the Help button at the bottom left part of the screen. Clicking Help will directly open the Driver Assist Customer Portal on your internet browser. You can either choose to contact us thru Email or Chat. For Email Support, kindly enter all the necessary information required (1) and click the green Submit Ticket (2) button to automatically create a support ticket. Expect a response within 24 hours. For immediate support, please click on the green Live Chat Now (3) button located at the bottom right side of the page. You should receive a response within the first minute, after you sent your first query. How Come I Can’t See The Chat Panel On The Customer Portal? Our Chat Support is available 24 x 7 during weekdays. However, during weekends, chat will not not be available round-the-clock. There would be instances where the chat panel won't even show on the portal. This only means that there is no support representative logged in during that time. You may, however, take full advantage of our Email Support, at any given time within the week. Launch Driver Assist from the Start menu or Desktop shortcut. Once the main application screen is open, click the License (1) tab from the top menu pane. You should be able to find your license key (2) information just below the User ID. Kindly save this information along with the registered Name and Email, found at the bottom of the page, as these are the pertinent details needed to pull up your account from our end. How Can I Update And Install the Latest Drivers For My Computer? Launch Driver Assist from the Start menu or Desktop shortcut. Once the main application screen is open, click the green Scan Now button from the top menu pane under the Home tab. 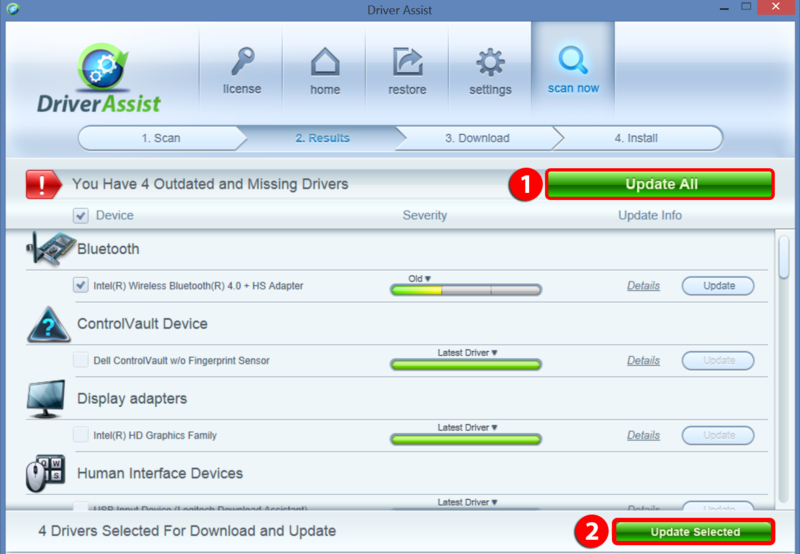 If you wish to update all the drivers, as per recommendation by Driver Assist, just click on the Update All (1) button. You also have the option to review which ones you would like to update first, by clicking on the tick-boxes one by one. Just click on Update Selected (2) to proceed. After downloading the latest drivers, you'll be presented with 2 options: Install All (1) or Install Selected (2). Proceed with the update according to your preference. You will then be asked to create a restore point (1). It is always advisable to do a backup whenever you perform any changes on your computer. Just check the tick-box (2) if you want to keep this option every single time you do an update. It recommended to do a Restart after the update. You may also choose to click Cancel if you want to manually do the reboot. What To Do If Driver Update Failed? The best way to deal with this notice is to click on Contact Support and submit a ticket on our portal. Live Chat may not be the best avenue for this type of issue. For us to look into this a bit further, we recommend that you instead Submit a Ticket on our portal to give us a better idea on what really triggered the error. What Types of Subscription Do You Offer? On the subscriptions page, kindly click the drop-down arrow (1) to see the 2 subscriptions available: one is the Standard License (6-month subscription) and the other is the Extended License (1-year subscription). 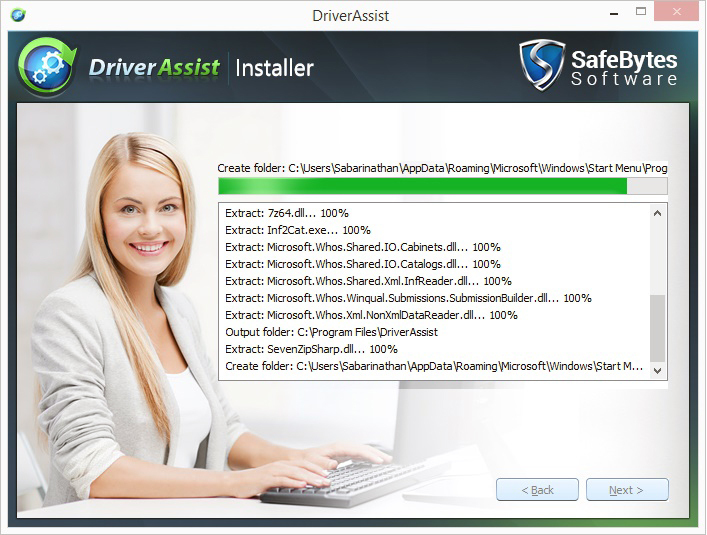 Can I Bundle Driver Assist With Safebytes Anti-Virus? Yes you can! While on the subscriptions page, all you have to do is to click the tick-box as shown on the image below then proceed with your purchase as is. How Much Are Your Software License Subscriptions? Our Standard License is competitively priced at $29.99 while the Extended License is at $39.99. 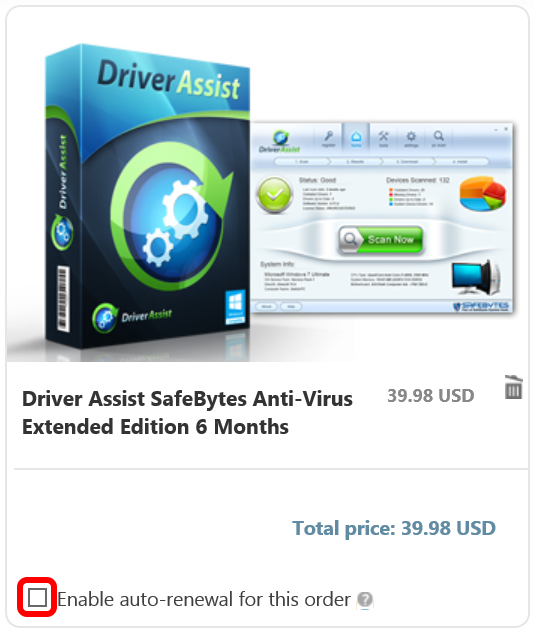 The bundle prices for Safebytes Anti-Virus are as follows: $9.99 and $14.99 respectively, depending on the type of subscription. We have a 24 x 7 Email Support through our Customer Portal, that can be accessed thru the Help button in Driver Assist. For the direct link, kindly check this one. You also have the luxury to chat with our courteous support representatives during weekdays, round-the-clock, if your concern needs immediate attention. Phone support is not available as of the moment but will be part of our invaluable service in the near future. How Can I Retrieve My License Key? If you have uninstalled Driver Assist already and forgot to take note of the license key, you can still retrieve it by going to this one. 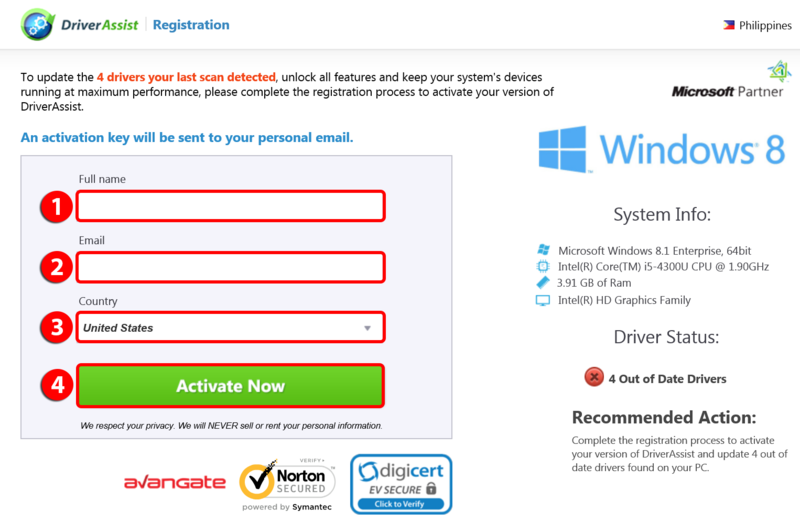 Just enter the Email Address (1) that you used, when you purchased our software. Enter the Verification Code (2) then hit Continue (3). Can I Set My Subscription To Renew Automatically? You can definitely do this during and after your purchase. While on the subscriptions page, you'll get a section like the one below, that will give you an option to set it to automatically renew. If you wanted to do the auto-renewal but was not able to do it during your purchase, you can opt to Submit a Ticket on our Customer Portal so we can process the change for you. Pretty soon, you can do this on your own too! We'll keep you updated on this same post. We stand behind all of our products. Trust SafeBytes to provide industry leading customer support and transparent refund policies. The initial purchase of Driver Assist software is backed by a 30-day unconditional money-back guarantee. In the event that purchase identification provided by the customer does not match a corresponding purchase of Driver Assist, the customer may be asked to provide secondary methods of purchase identification to locate their order and process the refund. Please feel free to contact us thru our Customer Portal so that we can assist you with your request. As long as it meets the requirements of our Refund Policy, then we would be more than willing to process it for you. 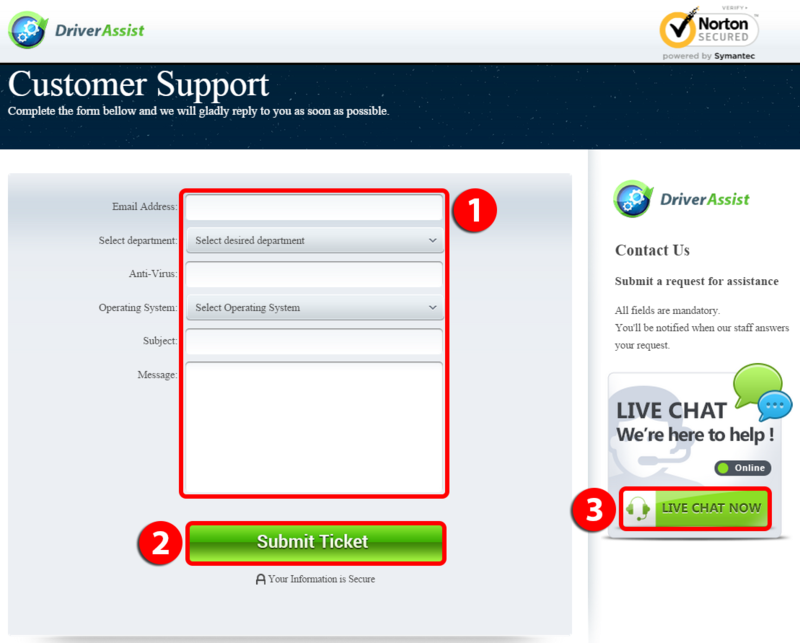 Thru the portal, you can either opt to Submit a Ticket about your request or you can also choose to chat with us. Either way, your satisfaction is our only concern. How Soon Can I Receive The Credit For My Refund Request? It would usually take 4-7 business days for it to be posted back to your account, after we process your refund request on our end. Kindly let us know right away, if you weren't able to receive your credit after the allotted time period so we can check the trail from our server. How Do I Set Driver Assist To Scan Automatically? Click on Settings > General Settings. To set it to automatically scan on every reboot, put a check mark on the tick boxes beside Automatically scan devices when application starts (1) and Run Driver Assist at PC startup (2). Do not forget to click on the green Save Settings button afterwards. Hoe stel ik DriverAssist in om automatisch te scannen? Klik op Instellingen> Algemene instellingen. Om automatisch scannen bij elke reboot in te stellen, zet U een vinkje bij de vakjes naast “apparaten automatisch scannen wanneer toepassing wordt gestart” (1) en Run DriverAssist bij opstarten van de PC (2). Vergeet niet om daarna te klikken op de groene knop Instellingen opslaan. Comment puis-faire pour que DriverAssist lance ses analyses automatiquement ? Cliquez sur Paramètres > Paramètres généraux. Pour faire que Driver Assist lance une analyse à chaque redémarrage, cochez les cases se trouvant à côté de Analyser automatiquement les périphériques lors du démarrage de l'application (1) et Lancer DriverAssist à chaque démarrage du PC (2). N'oubliez pas de cliquer ensuite sur le bouton vert Sauvegarder les paramètres. Wie kann ich festlegen, dass Driver Assist automatisch scannt? Klicken Sie auf Einstellungen > Allgemeine Einstellungen. Um festzulegen, dass das Programm bei jedem Neustart des Computers einen Scan startet, klicken Sie in das Kontrollkästchen neben "Geräte beim Start der Anwendung automatisch scannen" (1) und "DriverAssist beim Startup des PCs ausführen" (2). Vergessen Sie nicht, danach auf den grünen Button "Einstellungen speichern" zu klicken. Come posso impostare DriverAssist ad eseguire la scansione automatica? Clicca su Impostazioni > Impostazioni generali. Per impostare la scansione automatica ad ogni riavvio, spunta la casella apposita vicino a Esegui la scansione automatica delle periferiche all'avvio dell'applicazione (1) e Esegui Driver Assist all'avvio del PC (2). Non dimenticare, infine, di cliccare sul pulsante verde Salva Impostazioni. Как Мне Настроить DriverAssist Для Автоматического Сканирования? Нажмите Настройки > Общие настройки. Чтобы включить режим автоматического сканирования при каждой загрузке, поставьте галочку напротив «Автоматически сканировать устройства при запуске приложения» (1) и Запускать Driver Assist при старте компьютера (2). Затем не забудьте нажать на зеленую кнопку Сохранить Настройки. ¿Cómo se configura DriverAssist para explorar automáticamente? Haga clic en Configuración> Configuración general. Para configurarlo para escanear automáticamente en cada reinicio, ponga una marca de verificación en las casillas de verificación junto a escanear dispositivos automáticamente cuando se inicia la aplicación (1) y Run DriverAsssist en el arranque del PC (2). No te olvides de hacer clic en el botón verde Guardar configuración después. Como configuro o Driver Assist para fazer verificações automaticamente? Clique em Configurações> Configurações gerais. Para configurá-lo para verificar automaticamente em cada reinicialização, marque a caixa desta opção de verificação caixas de seleção ao lado de (1) Verificar os dispositivos automaticamente quando iniciar a aplicação e (2) Executar Driver Assist ao inicializar o PC . Não se esqueça de clicar no botão verde Salvar configurações depois. Hoe snel ontvang ik het krediet van mijn restitutie aanvraag? Het duurt normaal gesproken 4-7 werkdagen om naar uw rekening terug gestort te worden, nadat wij uw restitutie aanvraag aan onze kant verwerkt hebben. Laat u ons aub zo snel mogelijk weten als u uw krediet niet terug heeft gekregen na deze tijdperiode zodat wij het spoor van onze kant kunnen nagaan. À partir de quand puis-je recevoir le crédit de ma demande de remboursement ? Entre 4 et 7 jours ouvrés sont habituellement nécessaires afin que celui-ci soit déposé sur votre compte, après que nous ayons traité votre demande de remboursement de notre côté. Ayez l'amabilité s'il vous plaît de nous faire savoir tout de suite si vous n'avez pu recevoir votre crédit une fois passée la période impartie, pour que nous puissions tracer l'opération depuis nos serveurs. Wie schnell erhalte ich die Gutschrift meiner Rückerstattungsanfrage? Normalerweise dauert es ab der Verarbeitung der Rückerstattung durch uns 4-7 Geschäftstage, bis der Betrag Ihrem Konto gutgeschrieben wird. Lassen Sie es uns bitte wissen, falls Sie Ihre Gutschrift nach dieser Zeit nicht erhalten haben, damit wir sie über unseren Server nachverfolgen können. Entro quando potrò ricevere l’accredito per la mia richiesta di rimborso? Saranno necessari solitamente 4-7 giorni lavorativi prima che l'importo sia nuovamente disponibile sul tuo conto, una volta completata l'elaborazione della tua richiesta di rimborso. Ti preghiamo di notificarci immediatamente se non hai ancora ricevuto il tuo credito al termine del periodo indicato, in modo da poter controllare il percorso della transazione dai nostri server. Как быстро мне вернут средства? Обычно это занимает 4-7 рабочих дней с момента получения запроса на возврат. Пожалуйста, дайте нам знать если деньги не вернулись в течение этого срока, чтобы мы проверили транзакции. ¿Cuándo puedo recibir el crédito para mi solicitud de reembolso? Tomaría generalmente 4-7 días laborables para que pueda ser enviado de vuelta a su cuenta, después de procesar su solicitud de reembolso por nuestra parte. Por favor, háganos saber de inmediato, si no has recibido su crédito después de que el período de tiempo asignado, para que podamos comprobar el rastro de nuestro servidor. Em quanto tempo posso receber o crédito pela minha Restituição de Pedido? Isso geralmente levaria de 4-7 dias úteis para que possa ser enviada de volta para a sua conta, depois de processarmos o seu pedido de reembolso do nosso lado. Por favor, informe-nos de imediato, se você não conseguiu receber o seu crédito após o período de tempo previsto para que possamos verificar a localização desde o nosso servidor. Hoe vraag ik een Restitutie aan? Neem gerust contact met ons op via ons Klanten Portaal zodat wij u kunnen helpen met uw aanvraag. Zolang het voldoet aan de eisen van ons Restitutie Beleid, zijn we meer dan bereid om het voor u te verwerken. Middels het portaal, kunt u ervoor kiezen om een Ticket te Versturen over uw aanvraag of u kunt er ook voor kiezen om met ons te chatten. Hoe dan ook, uw tevredenheid is onze enige zorg. Veuillez-s'il vous plaît nous contacter via notre portail de soutien pour que nous puissions vous assister dans votre demande. Tant que celle-ci est conforme à notre politique de remboursement, nous serons alors plus que désireux de la traiter pour vous. Sur notre portail, vous pouvez soit soumettre un ticket mentionnant votre demande, soit tchater avec nos représentants. Dans tous les cas, votre satisfaction reste notre seule priorité. Bitte kontaktieren Sie uns über unser Kundenportal, damit wir Ihre Anfrage bearbeiten können. Wenn Sie die Voraussetzungen unserer Stornobedingungen erfüllen, werden wir die Rückerstattung gerne verarbeiten. Über das Portal können Sie entweder ein Ticket mit Ihrer Anfrage versenden oder Sie können mit uns chatten. Egal für welche Methode Sie sich entscheiden, Ihre Zufriedenheit ist immer unsere oberste Priorität. Come eseguo una richiesta di rimborso? Ti preghiamo di non esitare a contattarci tramite il nostro portale clienti in modo da poterti assistere con la tua richiesta. Fintanto che soddisfa i requisiti della nostra politica di rimborso, saremo a tua disposizione per assisterti nel completare l'operazione. Tramite il portale, potrai sia optare per inviare un ticket concernete la tua richiesta o potrai anche scegliere d'iniziare una chat con noi. Ad ogni modo, la tua soddisfazione è la nostra unica preoccupazione. Пожалуйста, не стесняйтесь и свяжитесь с нами через наш портал поддержки клиентов, чтобы мы помогли Вам в этом вопросе. Если Ваша просьба удовлетворяет требованиям нашей политики возврата денег, то мы с радостью выполним ее. Вы можете отправить нам запрос на возврат через портал или онлайн чат. В любом случае, наша главная задача, чтобы Вы остались довольны. ¿Cómo puedo pedir para un reembolso? Por favor no dude en contactar con nosotros a través de nuestro Portal del Cliente para que nosotros le podemos ayudar con su solicitud. Siempre cuando cumpla los requisitos de nuestra política de reembolso, estaríamos más que dispuestos a procesar su solicitud por usted. A través del portal, puede optar Enviar Ticket sobre su solicitud o también puedes elegir para charlar con nosotros. De cualquier manera, su satisfacción es nuestra única preocupación. Por favor, não hesite em contactar-nos através do nosso Portal do Cliente para que possamos ajudá-lo com a sua solicitação. Uma vez que se cumpra com os requisitos da nossa Política de Reembolso, nós estariamos mais do que dispostos de processá-lo para você. Através do portal, você pode optar por enviar um ticket sobre o seu pedido ou você também pode optar por conversar com a gente. De qualquer forma, a sua satisfação é a nossa única preocupação. Wat is jullie Restitutie Beleid? Wij staan achter al onze producten. Vertrouw op SafeBytes om een toonaangevende klantenondersteuning en transparant restitutie beleid aan te bieden. De eerste aankoop van DriverAssist software wordt ondersteund door een 60-dagen onvoorwaardelijke geld-terug garantie. In het geval dat de identificatie van de aankoop die door de klant gegeven wordt, niet overeen komt met een overeenkomstige aankoop van DriverAssist, kan de klant worden gevraagd om secundaire methoden van aankoop identificatie te verstrekken om hun bestelling te lokaliseren de restitutie te verwerken. Nous nous engageons envers tous nos produits. Soyez certain(e) du fait que Safebytes offre un service clientèle de pointe ainsi qu'une politique transparente de remboursement. L'achat initial de DriverAssist est couvert par une garantie de remboursement sans conditions de 60 jours. Dans l'éventualité où la preuve d'achat fournie par le client ne correspondrait pas à un achat de DriverAssist, il se peut que celui-ci soit emmené à produire des méthodes alternatives visant à identifier son achat, ce afin de localiser sa commande et traiter le remboursement. Wir stehen hinter allen unseren Produkten. Vertrauen Sie darauf, dass SafeBytes einen branchenführenden Kundenservice und transparente Stornobedingungen bietet. Für den anfänglichen Kauf der DriverAssist Software erhalten Sie eine uneingeschränkte 60-Tage Geld-zurück-Garantie. Falls die vom Kunden angegebene Kaufidentifikation zu keinem Kauf von DriverAssist passt, könnte der Kunde gebeten werden, eine zweite Methode der Kaufidentifikation anzugeben, um die Bestellung zu finden und die Rückerstattung zu verarbeiten. Garantiamo sempre il funzionamento di tutti i nostri prodotti. Affidati al supporto clienti di prima qualità e alle politiche trasparenti di rimborso offerte da SafeBytes. L'acquisto iniziale del software DriverAssist è garantito da una garanzia incondizionata a 60 giorni soddisfatti o rimborsati. Nel caso in cui il codice identificativo dell'ordine, fornito dal cliente, non corrisponda all'acquisto di DriverAssist, potrebbe essere richiesto ai clienti di fornire metodi secondari d'identificazione dell'acquisto per localizzare il loro ordine e procedere con il rimborso. Мы с уверенностью отвечаем за все наши продукты. Пользователи доверяют SafeBytes за лучшую в отрасли поддержку клиентов и прозрачные правила возврата средств. Покупка DriverAssist защищена 60-дневной безусловной гарантией возврата денег. Если данные о покупке, предоставленные пользователем, не совпадают с данными, указанными при заказе DriverAssist, мы попросим его о дополнительной идентификации, чтобы найти его заказ и вернуть денежные средства. Estamos detrás de todos nuestros productos. Confie en SafeBytes para proporcionar atención al cliente y políticas de reembolso transparentes, líderes en la industria. La compra inicial de software DriverAssist está respaldado por una incondicional garantía de devolución de 60 días. En el caso de que la identificación de compra proporcionada por el cliente no coincide con una compra correspondiente de DriverAssist, el cliente puede pedir que proporcione métodos secundarios de identificación de compra para localizar su orden y procesar el reembolso. Nós estamos por trás de todos os nossos produtos. Confie em SafeBytes para fornecer liderança na indústria de suporte ao cliente e as políticas de reembolso transparentes. A compra inicial de DriverAssist software é apoiada por uma incondicional garantia de reembolso de 60 dias. No caso de que a identificação de compra fornecida pelo cliente não corresponda a uma aquisição de DriverAssist, pode ser solicitado ao cliente que forneça métodos secundários de identificação de compra para localizar o seu pedido e processar o reembolso. Kan ik mijn Subsrcriptie automatisch vernieuwen? Dat kunt U zeker gedurende en na uw aankoop. Wanneer u op de Subscriptie pagina bent, krijgt u een sectie zoals die hieronder, welke u een optie geeft het automatisch te vernieuwen. Als u de auto-vernieuwing wilde doen, maar het niet tijdens de aankoop heeft kunnen doen, kunt u een Ticket Openen op ons Klanten Portaal zodat wij de verandering kunnen doen voor u. Heel snel, kunt u dit ook zelf doen. Wij informeren U hierover in deze post. Puis-je faire en sorte que ma souscription se renouvelle automatiquement ? Vous pouvez clairement faire ainsi pendant, comme après l'achat. Alors que vous vous trouvez sur la page de souscription, vous apercevez une section telle que celle-ci dessous, laquelle vous donne la possibilité d'opter pour le renouvellement automatique. Si vous souhaitiez le renouvellement automatique mais n'avez pu le choisir lors de l'achat, vous pouvez toujours soumettre un ticket sur notre Portail Client afin que nous puissions effectuer la modification à votre place. Vous pourrez également bientôt faire cela vous-même ! Nous vous tiendrons au courant sur ce même billet. Kann ich festlegen, dass mein Abonnement automatisch verlängert wird? Das können Sie während und nach dem Kauf selbstverständlich tun. Während Sie sich auf der Abonnementseite befinden, sehen Sie einen Bereich wie den unten stehenden, in dem sich eine Option zur Aktivierung der automatischen Verlängerung befindet. Falls Sie während des Kaufs keine automatische Verlängerung festlegen konnten können Sie ein Ticket an unser Kundenservice-Portal senden, damit wir die Änderung für Sie vornehmen können. Sehr bald können Sie das auch selbst erledigen! Wir werden Sie an dieser Stelle auf dem Laufenden halten. Posso impostare il rinnovo automatico dell’abbonamento? Potrai farlo sia durante e sia dopo l'acquisto. Mentre ti trovi sulla pagina abbonamenti vedrai una sezione come quella sottostante, che ti offrirà l'opzione d'impostare il rinnovo automatico. Se volevi impostare il rinnovo automatico, ma non sei stato in grado di farlo durante l'acquisto, potrai optare per inviare un ticket al nostro portale clienti così da poter eseguire la modifica per te. Ben presto, potrai farlo da solo! Continueremo ad aggiornarti su questo argomento. Можно ли автоматически продлевать подписку? Вы можете сделать это во время или после покупки. На странице подписки Вы увидите раздел (см. ниже), который даст Вам возможность настроить автоматические обновления. Если Вы хотите настроить эту функцию после покупки, Вы можете отправить запрос через наш портал обслуживания клиентов, чтобы мы все сделали за Вас. Скоро у нас появится возможность самостоятельной автоматической подписки, мы оповестим Вас об этом! ¿Puedo Configurar mi suscripción para renovar automáticamente? Definitivamente, usted puede hacer esto durante y después de su compra. Mientras que este en la página de suscripciones, obtendrás una sección como la siguiente, que le dará la opción de configurarlo para que se renuevan automáticamente. Si querías hacer la renovación automática, pero no fue capaz de hacerlo durante su compra, usted puede optar para enviar un ticket en nuestro Portal del Cliente para que podamos procesar el cambio para usted. Muy pronto, usted puede hacer esto por su cuenta también! Le mantendremos informado sobre este mismo post. Posso configurar minha assinatura para renovar automaticamente? Você pode definitivamente fazer isso durante e depois da compra. Uma vez que está na página de assinaturas, você vai ter uma seção como a que está abaixo, que lhe dará a opção de configurá-la para renovar automaticamente. Se você queria fazer a auto-renovação, mas não conseguiu fazê-la durante a sua compra, você pode optar por enviar um ticket no nosso Portal do Cliente para que possamos processar a mudança para você. Em breve, você poderá fazer isso você mesmo! Vamos mantê-lo atualizado sobre esta mesma publicação. Hoe kan ik mijn Licentie Code oproepen? Als U DriverAssist al verwijderd heeft, en vergeten bent de Licentie Code op te schrijven, kunt U het nog steeds oproepen door hierheen te gaan. Vul het Email adres (1) dat u gebruikt heeft bij het aanschaffen van onze software in. Vul de Verificatie Code (2) in en druk op Volgend (3). Comment puis-je récupérer ma clé de licence ? Si vous avez déjà désinstallé Driver Assist mais avez oublié de noter la clé de licence, vous pouvez toujours récupérer celle-ci en vous rendant ici. Entrez juste l'adresse de courriel (1) que vous avez utilisée lors de l'achat du logiciel. Entrez le code de vérification (2) puis appuyez sur Continuer (3). Wie kann ich meinen verlorenen Lizenzschlüssel wiederfinden? Falls Sie DriverAssist bereits deinstalliert haben und vergessen haben, sich Ihren Lizenzschlüssel aufzuschreiben, können Sie ihn unter folgendem Link finden. Geben Sie einfach die E-Mail Adresse (1) ein, die Sie beim Kauf der Software angegeben haben. Geben Sie den Bestätigungscode (2) ein und klicken Sie auf Weiter (3). Come posso recuperare la mia chiave di licenza? Se hai già disinstallato DriverAssist e ti sei dimenticato di prendere nota della tua chiave di licenza, potrai ancora recuperarla andando a questo link. Dovrai solo inserire l'indirizzo e-mail (1) che hai usato quando hai acquistato il nostro software. Inserisci il codice di verifica (2) e poi clicca Continua (3). Как я могу вновь получить Лицензионный Ключ? Если Вы удалили Driver Assist и забыли записать лицензионный ключ, Вы можете все еще получить его, зайдя на наш сайт. Просто введите Email (1), который Вы использовали при приобретении ПО, затем укажите код подтверждения, полученный на этот адрес (2) и нажмите кнопку "Продолжить" (3). ¿Cómo puedo recuperar mi clave de licencia? Si ya ha desinstalado DriverAssist y se olvidó de tomar nota de la clave de licencia, todavía puede recuperarlo por ir a éste. Solo tienes que introducir la dirección de correo electrónico (1) que ha utilizado, cuando compró el software. Ingrese el código de verificación (2) después haga clic en Continuar (3). Como posso recuperar a minha Chave de Licença? Se você desinstalou o DriverAssist e esqueceu-se de tomar nota da chave de licença, você ainda pode recuperá-la, com o seguinte. (1) Basta digitar o endereço de email que você usou, quando adquiriu o nosso software. (2) Digite o Código de Verificação, (3) e então clique em Continuar. Wat voor soorten hulp geven jullie? We hebben een E-mail ondersteuning via ons Klanten Portaal 24 uur per dag, die kan worden benaderd via de knop Help in DriverAssist. Voor de directe link, klikt u daar aub. U heeft ook de luxe om te chatten met onze hoffelijke ondersteuning vertegenwoordigers tijdens weekdagen, rond-de-klok, als Uw probleem onmiddellijke aandacht nodig heeft. Telefonische ondersteuning is op dit moment niet beschikbaar, maar zal deel uitmaken van onze nuttige diensten in de nabije toekomst. Quel type de support offrez vous ? Nous assurons un service de support 24 x 7 par courriel sur notre portail client, lequel est accessible via le bouton Aide se trouvant dans DriverAssist. Pour y accéder directement, veuillez-s'il vous plaît suivre ce lien. Vous bénéficierez aussi, pendant les jours de semaine et 24 heures sur 24 et si votre demande requiert une attention immédiate, du luxe de tchater avec nos représentants accueillants de notre service de support. L'aide par téléphone n'est pas encore disponible au sein de notre précieux service, mais celle-ci le sera bientôt. Welche Arten von Kundenservice bieten Sie an? Wir bieten über unser Kundenportal einen 24/7 Kundenservice an, den Sie über den Hilfe-Button von DriverAssist erreichen. Den direkten Link finden Sie hier. An Wochentagen können Sie auch rund um die Uhr mit unseren engagierten Kundenservicemitarbeitern chatten, falls es sich um ein dringendes Problem handelt. Ein Kundenservice per Telefon steht derzeit nicht zur Verfügung, wird aber in Zukunft zu einem unverzichtbaren Teil unserer Services werden. Offriamo un supporto via e-mail 24/7 tramite il nostro portale clienti, cui potrai accedere tramite il pulsante Guida nel DriverAssist. Per il link diretto, ti preghiamo di controllare qui. Hai anche la possibilità di chattare con i nostri cortesi rappresentanti del supporto clienti durante i giorni feriali, 24 ore su 24, se necessiti d'assistenza immediata. Al momento non è disponibile un'assistenza telefonica ma, a breve, farà sicuramente parte del nostro prezioso servizio. Какие Виды Поддержки Вы Предоставляете? У нас есть поддержка в режиме 24 x 7 по электронной почте через наш портал для клиентов, который доступен щелчком по кнопке «Справка/Помощь» в самой программе Driver Assist. Кроме того, у Вас есть возможность пообщаться в чате с вежливым представителем службы поддержки круглосуточно в режиме реального времени, если Ваша проблема требует немедленного внимания. К сожалению, пока мы не можем предоставить поддержку по телефону, но вскоре это будет исправлено. ¿Qué tipos de apoyo proporciona? Tenemos un Soporte 24 x 7 por correo electrónico a través de nuestro Portal de clientes, que se puede acceder a través del botón Ayuda de DriverAssist. Para el enlace directo, compbrueba éste. Usted también tiene el lujo de charlar con nuestros representantes de atención cortés durante los días de semana habiles, las veinticuatro horas, si su preocupación necesita atención inmediata. El soporte telefónico no está disponible en este momento, pero será parte de nuestro servicio de valor incalculable en un futuro próximo. Que tipos de suporte que vocês oferecem? Temos uma equipe de suporte 24 x 7 através de email no nosso Portal do Cliente, que pode ser acessado através do botão Ajuda no DriverAssist. Para o Link direto, gentilmente verificar este. Você também tem o luxo de conversar com nossos gentis representantes de suporte durante a semana, a toda hora, se a sua preocupação precisa de atenção imediata. O suporte por telefone não está disponível de momento, mas será parte do nosso valioso serviço em um futuro próximo. Hoeveel zijn uw software licentie abonnementen? Onze Standaard Licentie is concurrerend geprijsd op $ 29,99, terwijl de Uitgebreide Licentie $ 39,99 is. De bundel prijzen voor Safebytes Anti-Virus zijn als volgt: $ 9,99 en $ 14,99 respectievelijk, afhankelijk van het type abonnement. Combien coûtent vos licences ? Notre licence standard est à un prix compétitif de 29,99 $ USD, tandis que la licence prolongée coûte 39,99 $ USD. Les tarifs des offres combinées avec Safebytes Anti-Virus sont tels que suit : 9,99 $ USD et 14,99 $ USD respectivement, en fonction du type de souscription. Wie viel kosten Ihre Abonnements der Software-Lizenzen? Unsere Standard-Lizenz kostet konkurrenzfähige $29,99, während die erweiterte Lizenz $39,99 kostet. Die Paketpreise für Safebytes Anti-Virus betragen abhängig von der Art des Abonnements $9,99 bzw. $14,99. Quanto costano gli abbonamenti alla licenza del software? La nostra licenza standard ha un prezzo competitivo di $29,99 mentre quello della licenza prolungata è di $39,99. I prezzi di pacchetto per il Safebytes Anti-Virus sono i seguenti: $9,99 e $14,99 rispettivamente, secondo il tipo di sottoscrizione. Сколько стоит лицензия на ПО? Наша Стандартная лицензия на полгода стоит всего $29.99 а Расширенная лицензия на год - $39.99. Стоимость на Пакеты с Антивирусом Safebytes: $9.99 и $14.99 соответственно, в зависимости от типа подписки. ¿Cuánto cuestan sus Suscripciones Licencia de Software? Nuestra Licencia estándar tiene un precio competitivo de $ 29.99, mientras que la licencia ampliada es de $ 39.99. Los precios de paquetes para Safebytes Anti-Virus son los siguientes: $ 9,99 y $ 14,99, respectivamente, en función del tipo de suscripción. Quanto custa as Inscrições de Licença de Software? Nossa Licença Padrão tem um preço competitivo em US$ 29,99, enquanto que a de licenças extendidas é de US $ 39,99. Os preços do pacote para Anti-Virus Safebytes são os seguintes: US $ 9,99 e $ 14,99, respectivamente, dependendo do tipo de assinatura. 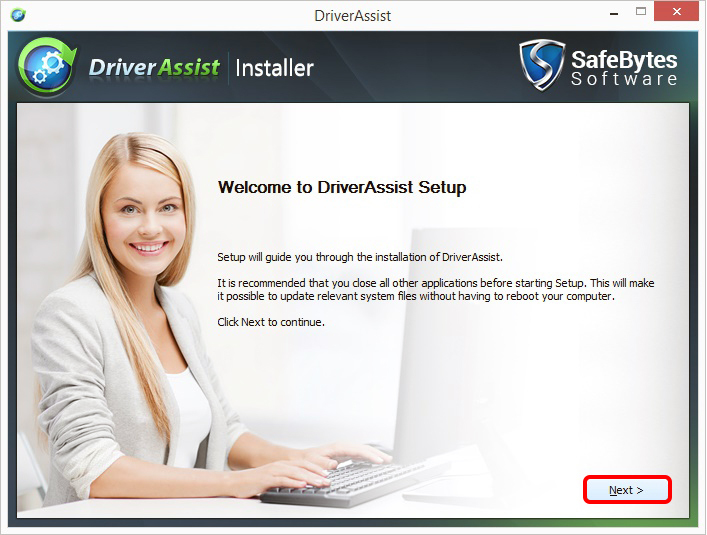 Kan ik DriverAssist Met Safebytes Anti-Virus bundelen? Ja, dat kan! Terwijl U op de pagina abonnementen bent, hoeft u alleen te klikken de tick-box zoals op de afbeelding hieronder, en dan verder gaan met uw aankoop zoals ze is. Puis-je combiner Driver Assist avec l’antivirus de Safebytes ? Oui, vous le pouvez ! Alors que vous êtes sur la page de souscription, il vous suffit simplement de cliquer sur la case à cocher telle que présentée sur l'image ci-dessous et de procéder à votre achat tel quel. Kann ich Driver Assist mit Safebytes Anti-Virus bündeln? Ja, das ist möglich! Während Sie sich auf der Abonnementseite befinden, müssen Sie dafür einfach das Kontrollkästchen auswählen (wie im unten stehenden Bild gezeigt) und mit dem Kauf fortfahren. 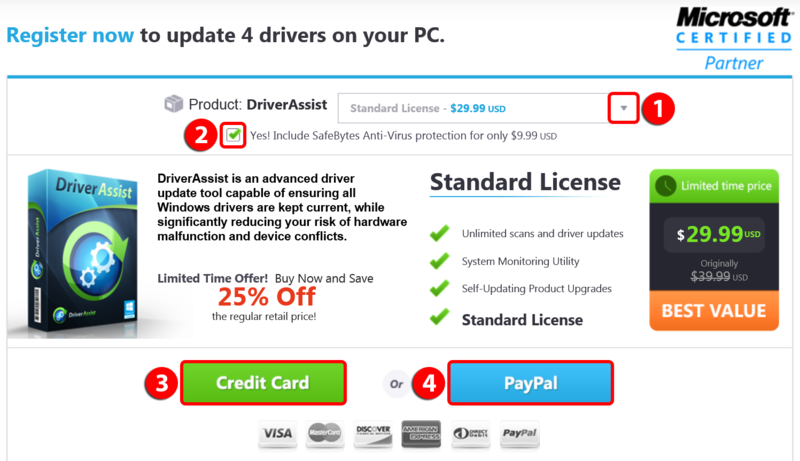 Posso abbinare DriverAssist con il Safebytes Anti-Virus? Certo! Mentre ti trovi sulla pagina degli abbonamenti tutto quello che devi fare, è cliccare sulla casella apposita, come mostrato nell'immagine sottostante, per poi procedere con l'acquisto. Могу ли я заказать вместе DriverAssist и Антивирус Safebytes? Да, конечно! Просто отметьте эту опцию галочкой на странице подписки, как показано на изображении ниже, а затем продолжите покупки. 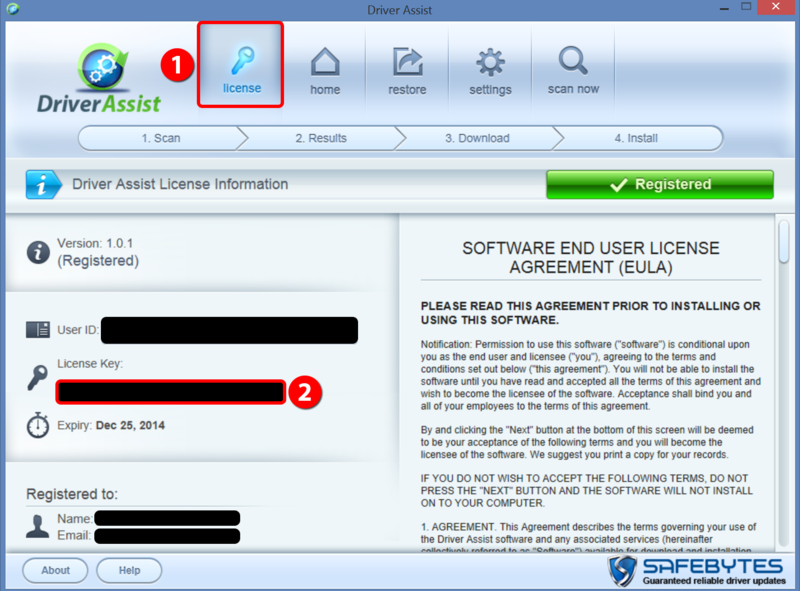 ¿Puedo ajuntar DriverAssist Con Safebytes Anti-Virus? Sí se puede! En la página de suscripciones, lo único que tienes que hacer es hacer clic en la casilla de verificación que aparece en la imagen de abajo y luego proceder con su compra como es. 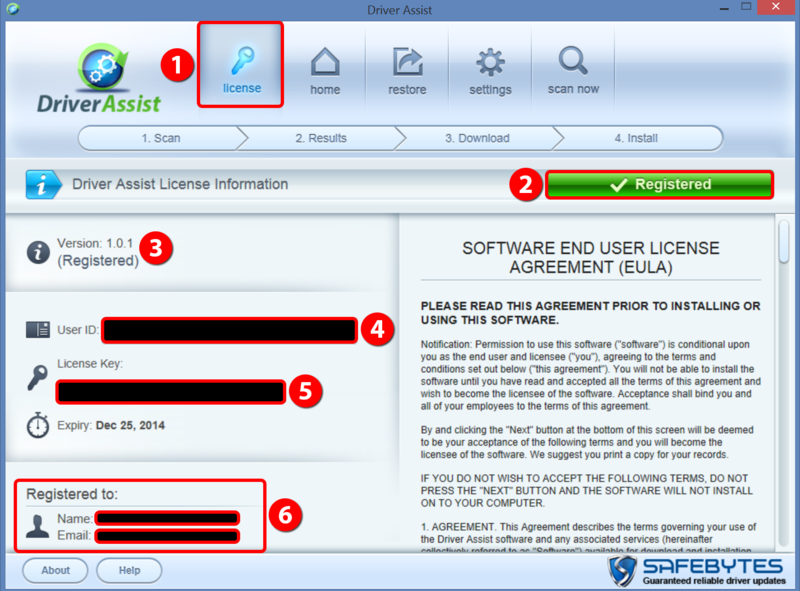 Posso empacotar DriverAssist com o Anti-Virus Safebytes? Sim, pode! Uma vez esteja na página de assinaturas, tudo que você tem que fazer é clicar na caixa de opção, como mostra na imagem abaixo, e então, prosseguir com a sua compra imediata. Wat voor abonnementen bieden jullie aan? Op de abonnementen pagina, klikt u op de vervolgkeuzepijl (1) om de 2 abonnementen beschikbaar te zien: de ene is de Standard Licentie (6-maanden abonnement) en de andere is de Uitgebreide Licentie (1-jarig abonnement). Quels types de souscriptions proposez-vous ? Sur la page de souscriptions, veuillez-s'il vous plaît cliquer sur la flèche déroulante (1) afin d'afficher les deux souscriptions disponibles : l'une d'entre elles est la licence standard (souscription de 6 mois) et l'autre correspond à la licence étendue (souscription de 1 an). Welche Arten von Abonnements bieten Sie an? Klicken Sie auf der Abonnement-Seite auf den Pfeil des Auswahlmenüs (1), um die beiden verfügbaren Abonnements zu sehen: die Standard-Lizenz (6-Monats-Abonnement) und die erweiterte Lizenz (1-Jahres-Abonnement). Quali tipi di abbonamento offrite? Sulla pagina delle sottoscrizioni, clicca sulla freccia a discesa (1) per vedere i 2 abbonamenti disponibili: una è la licenza standard (6 mesi di abbonamento) e l'altra è la licenza prolungata (1 anno di abbonamento). Какие типы подписки вы предлагаете? Пожалуйста, щелкните стрелку раскрывающегося списка на странице «Подписки», чтобы увидеть 2 доступные подписки: первая-стандартная лицензия (на 6 месяцев), а вторая- расширенная (1 год подписки). ¿Qué tipos de suscripción ofrecen? En la página de suscripciones, haga clic amablemente en la flecha hacia abajo (1) para ver las 2 suscripciones disponibles: una es la Licencia estándar (suscripción de 6 meses) y la otra es la licencia ampliada (suscripción de 1 año). Quais os tipos de Inscrições que vocês oferecem? Na página de assinaturas, por favor clique na seta para baixo (1) para ver as duas assinaturas disponíveis: uma é a Licença Padrão (inscrição de 6 meses) e a outra é a de Licença Extendida (assinatura de 1 ano). Wat moet ik doen als een Driver Update niet werkt? De beste manier om met dit bericht om te gaan is door te klikken op Contact opnemen met ondersteuning en een ticket op ons Portaal te openen. Live Chat is misschien niet de beste weg voor dit soort probleem. Zodat wij dit verder kunnen onderzoeken, raden wij u aan dat u een ticket op ons Portaal opent, zodat wij een beter idee over wat de werkelijke oorzaak van de fout kunnen krijgen. Que faire en cas d’échec de la mise à jour ? La meilleure façon de parer à une telle éventualité est de cliquer sur Contacter le support et de soumettre un ticket sur notre portail. Le tchat en direct n'est pas forcément la meilleure solution dans ce genre de cas. Pour que nous puissions analyser votre demande de façon plus conséquente, nous vous recommandons à la place de soumettre un ticket sur notre portail, afin que nous puissions obtenir une meilleure idée de ce qui a pu causer le problème rencontré. Was kann ich tun, falls das Update des Treibers fehlgeschlagen ist? Die beste Möglichkeit, um dieses Problem zu lösen, ist es, auf "Kundenservice kontaktieren" zu klicken und ein Ticket an unser Portal zu senden. Der Live Chat ist nicht die beste Kommunikationsmethode für diese Art von Problem. Damit wir uns den Fall genauer ansehen können, empfehlen wir Ihnen, über unser Portal ein Ticket an den Kundenservice zu senden. So können wir ermitteln, was den Fehler ausgelöst hat. Che cosa devo fare se l’aggiornamento del driver non è riuscito? Il modo migliore per affrontare questa notifica è di cliccare su Contatta supporto ed inviare un ticket al nostro portale. La chat Live potrebbe non essere la migliore soluzione per questo tipo di problema. Per permetterci d'investigare più a fondo su questo problema, ti consigliamo d'inviare un ticket al nostro portale, in modo da fornici un'idea più precisa sulle reali cause che hanno fatto scattare questo errore. Что делать, если не удалось обновить драйвер? Советуем Вам обратиться в службу поддержки и отправить запрос на нашем портале. К сожалению, чат - это не лучший способ решения подобных вопросов. Чтобы мы лучше разобрались с проблемой, предоставьте нам как можно больше информации о том, что ее вызвало. ¿Qué hacer si la actualización del controlador Fallo? La mejor manera de manejar este aviso es hacer clic en Contacte con el soporte para enviar un ticket a nuestro portal. Puede ser que Chat en vivo no es la mejor manera para resolver este tipo de problema. Para que podemos ayudarle mejor, le recomendamos que nos envies un ticket a traves de nuestro portal para darnos una mejor idea sobre lo que realmente provocó el error. A melhor maneira de lidar com este aviso é clicando em Contactar com o Suporte e enviar um ticket ao nosso portal. O Live Chat pode não ser o melhor caminho para este tipo de problema. Para nós darmos uma melhor olhada, recomendamos que você Envie um Ticket no nosso portal para dar-nos uma idéia melhor sobre o que realmente provocou o erro. Hoe kan ik de nieuwste drivers updaten en installeren op mijn computer? Lanceer DriverAssist van het Startmenu of van de snelkoppeling op het bureaublad. Zodra het hoofd toepassing scherm is geopend, klikt u op de groene Scan Nu knop van het top menu paneel onder het tabblad Start. 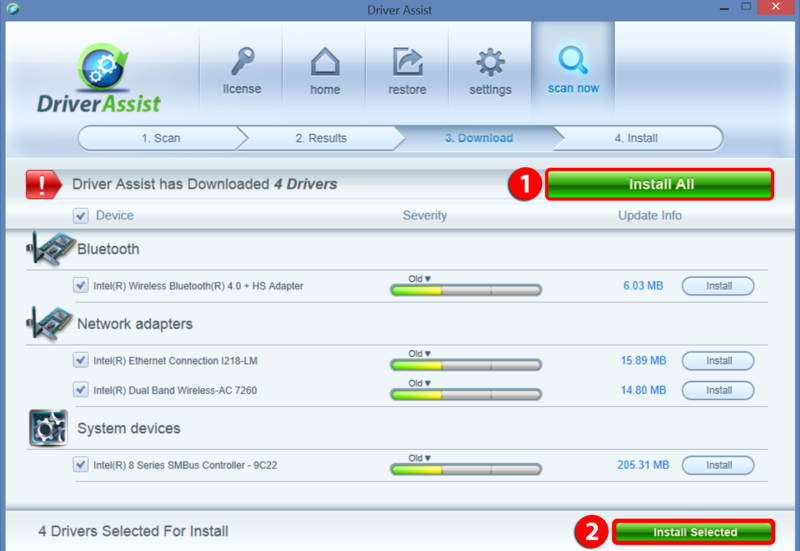 Wilt u alle drivers updaten, zoals per aanbeveling van DriverAssist, klikt u op de update Alle (1) knop. U heeft ook de mogelijkheid om te bekijken welke U eerst zou willen updaten, door een vóór een de tick-boxen aan te klikken. Klik gewoon op Update Geselecteerd (2) om door te gaan. Na het downloaden van de nieuwste drivers, heeft u 2 opties: Instaleer Alle(1) of Instaleer Geselecteerd (2). Ga door met de update volgens uw preferentie. U wordt dan gevraagd om een herstelpunt (1) te creëren. Het is altijd raadzaam om een back-up te doen wanneer u wijzigingen op uw computer wilt uitvoeren. Klik de tick-box (2) als u deze optie wilt houden elke keer dat u een update doet. Het wordt aanbevolen om een Herstart te doen na de update. U kunt er ook voor kiezen om te klikken op Annuleren als u de reboot handmatig wilt doen. Lancez DriverAssist depuis le menu Démarrer ou bien depuis son icône de bureau. Une fois que l'écran principal de l'application est ouvert, cliquez sur le bouton vert Analyser maintenant, se trouvant sur le menu supérieur, dans l'onglet Accueil. Si vous désirez mettre à jour tous les pilotes, tel que recommandé par Driver Assist, cliquez simplement sur le bouton Mettre tout à jour. Vous avez également la possibilité de passer en revue ceux que vous voudriez mettre d'abord à jour en cliquant sur les cases à cocher une par une. Cliquez ensuite sur Mettre à jour les pilotes sélectionnés (2) afin de procéder. Après avoir téléchargé les pilotes les plus récents, vous aurez le choix entre deux options : Installer tout (1) ou bien Installer les pilotes sélectionnés (2). Procédez à la mise à jour en fonction de votre choix. Il vous sera alors demandé de créer un point de restauration (1). Il est toujours recommandé de faire une sauvegarde chaque fois que vous opérez des changements sur votre ordinateur. Cliquez simplement sur la case à cocher (2) si vous voulez conserver cette option chaque fois que vous effectuerez une mise à jour. Il est conseillé de redémarrer votre ordinateur une fois la mise à jour terminée. Vous pouvez également cliquer sur annuler dans le cas où vous souhaiteriez effectuer un redémarrage manuel. Wie kann ich die neuesten Treiber für meinen Computer aktualisieren und installieren? Starten Sie DriverAssist über das Startmenü oder die Desktop-Verknüpfung. Sobald der Hauptbildschirm der Anwendung geöffnet wurde, klicken Sie auf den grünen Button "Jetzt scannen" im oberen Menü (unter dem Karteireiter Startseite). Falls Sie alle Treiber aktualisieren möchten, was von DriverAssist empfohlen wird, klicken Sie einfach auf "Alle aktualisieren" (1). Sie haben auch die Möglichkeit, bestimmte Treiber zuerst zu aktualisieren, indem Sie die Kontrollkästchen nacheinander aktivieren. Klicken Sie einfach auf "Ausgewählte aktualisieren" (2), um fortzufahren. Nachdem Sie die aktuellsten Treiber heruntergeladen haben, sehen Sie 2 Optionen: Alle installieren (1) oder Ausgewählte installieren (2). Fahren Sie mit Ihrem bevorzugten Update fort. Jetzt werden Sie gebeten, einen Wiederherstellungspunkt zu erstellen (1). Es ist immer empfehlenswert, ein Backup vorzunehmen, wenn Sie Änderungen an Ihrem Computer durchführen. Wählen Sie einfach das Kontrollkästchen (2), falls Sie diese Option für jedes Update beibehalten möchten. Es wird empfohlen, den Computer nach jedem Update neu zu starten. Sie können allerdings auch auf Abbrechen klicken, falls Sie den Neustart manuell vornehmen möchten. Come posso installare ed aggiornare i driver più recenti per il mio computer? Apri DriverAssist dal menu "Start" o dal collegamento sul desktop. Una volta aperta la schermata principale, clicca sul pulsante verde Scansiona ora dal menu in alto sotto la scheda Home. Se desideri aggiornare tutti i driver, come consigliato da DriverAssist, ti basterà cliccare sul pulsante Aggiorna tutti (1). Avrai anche la possibilità di scegliere quali vuoi aggiornare per primi, cliccando sulla casella apposita, uno ad uno. Ti basterà cliccare su Aggiorna selezionato (2) per procedere. Dopo aver scaricato gli ultimi driver, ti verranno presentate 2 opzioni: Installa tutti (1) o Installa selezionato (2). Procedi con l'aggiornamento secondo le tue preferenze. Ti sarà poi richiesto di creare un punto di ripristino (1). È sempre consigliato eseguire un backup quando esegui delle modifiche sul tuo computer. Spunta la casella apposita (2) se vuoi mantenere quest'opzione ogni volta che esegui un aggiornamento. Ti consigliamo di riavviare il computer dopo l'aggiornamento. Potrai anche scegliere di cliccare Annulla se vuoi eseguire manualmente il riavvio del PC. Как обновить и установить последние драйверы для моего компьютера? Запустите Driver Assist из меню "Пуск" или с помощью ярлыка на рабочем столе. После открытия главного экрана приложения, нажмите на зеленую кнопку Scan Now в верхнем меню под вкладкой "Главная". Если Вы хотите обновить все драйверы, как рекомендует Driver Assist, просто нажмите кнопку "Обновить Все" (1). Вы также можете выбрать желаемые обновления, отметив их галочками и нажав "Обновить Выделенные (2). После загрузки последних версий драйверов, Вы увидите 2 варианта: установить все (1) или установить выбранные (2). Продолжить обновление в соответствии с Вашими предпочтениями. Затем Вам будет предложено создать точку восстановления (1). Всегда рекомендуется делать резервную копию, когда Вы выполняете какие-либо изменения. Просто отметьте эту опцию галочкой (2), чтобы архивировать при каждом обновлении. После обновления рекомендуется автоматическая перезагрузка или Вы можете нажать "Отмена", чтобы перезагрузить систему позже вручную. ¿Cómo puedo actualizar e instalar los últimos controladores para mi equipo? Inicie DriverAssist desde el menú Inicio o el acceso directo del escritorio. Una vez que la pantalla principal de la aplicación está abierta, haga clic en el botón verde para Escanear Ahora desde el panel de menú superior en la pestaña Inicio. Si desea actualizar todos los controladores, según la recomendación de DriverAssist, simplemente haga clic en el botón Actualizar todo (1). Usted también tiene la opción de revisar cuales usted desea actualizar primero, haciendo clic en las casillas de verificación, una por una. Simplemente haga clic en Actualizar seleccionada (2) para proceder. Después de descargar los controladores más recientes, se le presentará con 2 opciones: Instalar Todos (1) o instalar seleccionada (2). Procede con la actualización de acuerdo a su preferencia. A continuación se le pedirá que cree un punto de restauración (1). Siempre es recomendable hacer una copia de seguridad al llevar a cabo cualquier cambio en su equipo. Sólo tienes que hacer clic en la casilla (2) si desea mantener esta opción cada vez que usted hace una actualización. Se recomienda hacer un reinicio después de la actualización. También puede optar por hacer clic en Cancelar si quiere hacer manualmente el reinicio. Abra o DriverAssist no menu Iniciar ou no atalho da área de trabalho. Quando a tela principal da aplicação abrir, clique no botão verde Verificar Agora no painel do menu superior na guia Início. Se você quiser atualizar todos os drivers, como recomendação de DriverAssist, (1)basta clicar sobre o botão Atualizar Todos. (2) Você também tem a opção de avaliar qual deles você gostaria de atualizar primeiro, clicando sobre caixa de opção, um por um. Basta clicar em Atualizar Selecionada para prosseguir. Depois de baixar os drivers mais recentes, você será presenteado com 2 opções: (1) Instalar Todos ou (2) Instalar Selecionado. Prossiga com a atualização de acordo com a sua preferência. (1) Em seguida, será solicitado a criação de um ponto de restauração. É sempre aconselhável fazer um backup sempre que você realizar quaisquer alterações no seu computador. (2) Basta assinalar a caixa desta opção se você deseja manter esta opção cada vez que você faça uma atualização. É recomendado reiniciar após a atualização. Você também pode optar por clique em Cancelar se você quiser fazer manualmente a reinicialização. Waar kan ik mijn Licentie Code vinden? Lanceer DriverAssist van het Startmenu of de snelkoppeling op het bureaublad. Wanneer het hoof applicatie scherm open is, klik op het tabblad Licentie (1) van het boventste menu venster. U moet uw licentie code (2) informatie net onder de gebruikers-ID vinden. Gelieve deze informatie op te slaan, samen met de geregistreerde naam en e-mail, die u kunt vinden beneden aan de pagina, daar deze de relevante gegevens zijn die nodig zijn om uw account te localizeren van onze kant. Lancez DriverAssist depuis le menu Démarrer ou son icône de bureau. Une fois que l'écran principal de l'application est ouvert, cliquez sur l'onglet licence (1) figurant sur le menu supérieur. Vous devriez apercevoir votre clé de licence (2) affichée au bas de l'ID utilisateur. Veuillez-s'il vous plaît sauvegarder cette information ainsi que le nom et l'adresse de courriel enregistrés, se trouvant au bas de la page, car ceux-ci représentent les informations dont nous avons besoin afin de pouvoir récupérer les données de votre compte. Starten Sie DriverAssist über das Startmenü oder die Desktop-Verknüpfung. Sobald sich der Hauptbildschirm der Anwendung geöffnet hat, klicken Sie auf den Karteireiter Lizenz (1) im oberen Menü. Ihren Lizenzschlüssel (2) finden Sie direkt unter Ihrer Benutzer-ID. Bewahren Sie ihn, sowie den registrierten Namen und die E-Mail Adresse, welche Sie im unteren Bereich der Seite finden, auf, da wir diese Daten benötigen, um Ihr Konto zu finden. Dove posso trovare la mia chiave di licenza? Apri DriverAssist dal menu "Start" o dal collegamento del desktop. Una volta che la schermata principale è aperta, clicca sulla scheda di Licenza (1) dal menu in alto. Dovresti essere in grado di vedere le informazioni sulla tua chiave di licenza (2) proprio sotto l'ID utente. Ti preghiamo di salvare queste informazioni insieme al nome registrato e all'indirizzo e-mail, che si trova nel fondo della pagina, poiché questi sono i dettagli pertinenti, necessari al supporto clienti, per trovare il tuo conto. Где мне найти Лицензионный Ключ? Запустите Driver Assist из меню "Пуск" или с помощью ярлыка на рабочем столе. После открытия главного экрана программы, щелкните по вкладке Лицензия (1) в верхнем меню. Затем Вы должны увидеть лицензионный ключ (2), информация о нем находится чуть ниже ID пользователя. Пожалуйста, сохраните эти данные наряду с зарегистрированным именем и адресом электронной почты, указанными внизу страницы, они могут понадобится. ¿Dónde puedo encontrar mi clave de licencia? Inicie DriverAssist desde el menú Inicio o el acceso directo del escritorio. Una vez que la pantalla principal de la aplicación está abierta, haga clic en ficha de la licencia (1) desde el panel de menú superior. Usted debe poder encontrar la información de la clave de licencia (2) justo debajo de la ID de usuario. Sírvase guardar esta información junto con el nombre y correo electrónico registrada, que se encuentra en la parte inferior de la página, ya que estos son los detalles pertinentes necesarios para encontrar su cuenta de nuestra parte. Abrindo o DriverAssist no menu Iniciar ou no atalho da área de trabalho. Quando a tela principal do aplicativo abrir, (1)clique no guia de Licenças no painel de menu superior. (2)Você poderá encontrar as informações da sua chave de licença logo abaixo do ID do usuário. Por favor, salve essas informações, juntamente com o nome registrado e o email, encontrado na parte inferior da página, já que estes são os detalhes pertinentes necessários para que possamos localizar a sua conta. Hoe Komt het dat Ik geen Chat paneel zie op het Klant Portaal? Onze Chatondersteuning is 24 x 7 tijdens weekdagen. Echter, tijdens het weekend, is de chat niet beschikbaar niet rond-de-klok. Er zouden gevallen kunnen zijn waar het chat-paneel niet eens zichtbaar is op het portaal. Dit betekent alleen dat er geen support medewerker ingelogd is gedurende die tijd. U mag echter ten volle profiteren van onze E-mail ondersteuning, op elk gegeven moment in de week. Comment cela ce fait-il que je ne peux apercevoir le panneau de tchat sur le portail client ? Notre service de support par tchat est disponible 24 x 7 pendant la semaine. Cependant, le week-end, ce service n'est pas disponible 24 heures sur 24. Dans certains cas, le panneau de tchat n'apparaît même pas sur le portail. Cela signifie simplement qu'aucun représentant du support n'est connecté à ce moment-là. Vous pouvez cependant profiter pleinement de notre service de support par courriel, à n'importe quel moment de la semaine. Warum sehe ich kein Chat-Fenster im Kundenportal? Unser Kundenservice per Chat steht Ihnen während der Wochentage 24/7 zur Verfügung. Am Wochenende ist der Chat allerdings nicht rund um die Uhr besetzt. Manchmal wird das Chat-Fenster gar nicht im Portal angezeigt, was bedeutet, dass derzeit kein Kundenservicemitarbeiter eingeloggt ist. Sie können unseren Kundenservice allerdings jederzeit und an jedem Tag der Woche per E-Mail kontaktieren. Perché non riesco a vedere il pannello chat sul portale clienti? Il nostro supporto via chat è disponibile 24/7 nei giorni feriali. Tuttavia, durante i fine settimana, la chat non sarà disponibile 24 ore su 24. Ci potrebbero essere casi in cui il pannello chat non verrà nemmeno mostrato sul portale. Questo significa solamente che non è presente, in quel momento, alcun rappresentante del supporto clienti. Potrai, tuttavia, usufruire del nostro supporto via e-mail, in ogni momento della settimana. Почему я не вижу панель чата на портале поддержки клиентов? Наш чат поддержки работает 24 x 7 в будние дни. Однако в выходные чат может быть недоступен, поэтому иногда его не видно на сайте. Это всего лишь означает, что представителя службы поддержки нет на месте, в этом случае Вы можете в полной мере и в любое время воспользоваться нашей справкой по электронной почте. ¿Cómo puede ser que no puede ver el panel de chat en El Portal del cliente? Nuestro Soporte Chat está disponible 24 x 7 durante los días habiles de semana. Sin embargo, durante los fines de semana, el chat no esta disponible las veinticuatro horas del día. Habrían casos en que el panel de chat no se muestran incluso en el portal. Esto sólo significa que no hay ningún representante de soporte conectado durante ese tiempo. Es posible, sin embargo, sacar el máximo provecho de nuestro correo de soporte, en un momento dado, dentro de la semana. Como é que eu não posso ver o painel de chat no Portal do Cliente? Nosso Suporte via Chat está disponível 24 x 7 durante a semana. No entanto, durante a semana, o chat não vai não estar disponível a toda a hora. Haverá casos em que o painel de chat não vai mostrar no portal. Isso só significa que não há nenhum representante de suporte logado durante esse tempo. Você pode, no entanto, tirar o máximo proveito do nosso e-mail de suporte, a qualquer momento dentro da semana. Lanceer DriverAssist. Klik op het Home tabblad en klik daarna de Helpknop onderaan links op het scherm. Door op Help te klikken opent U het DriverAssist Klant Portaal op Uw internet browser. U kunt kiezen ons via e-mail te kontakteren of via Chat. Voor Email Support, vult u alstublieft alle benodigde informatie in (1) en klik op de groene knop Submit Ticket (2) om automatisch een support tickent te creëren. U kunt een antwoord verwachten binnen 24 uur. Voor onmiddelijke hulp, klikt U op de groene Chat Nu (3) knop, welke zich beneden rechts op de pagina bevindt. U moet dan een antwoord krijgen binnen de eerste minuut, nadat u uw eerste vraag heeft gesteld. Comment puis-je contacter le support technique ? Lancez DriverAssist. Cliquez sur l'onglet Accueil et puis cliquez sur le bouton Aide se trouvant en bas à gauche de l'écran. Cliquer sur Aide ouvrira directement le portail d'assistance client de DriverAssist sur votre navigateur. Vous pouvez nous contacter soit par courriel soit par Tchat. Pour ce qui est du support par courriel, veuillez-s'il vous plaît entrer toutes les informations requises (1) et cliquer sur le bouton vert Soumettre le ticket (2) afin qu'un ticket de support soit automatiquement créé. Attendez-vous à une réponse dans les 24 heures. Pour une aide immédiate, veuillez-s'il vous plaît cliquer sur le bouton vert Tchater en direct (3) se trouvant en bas à droite de la page. Vous devriez recevoir une réponse dans les 60 secondes suivant votre première demande. Starten Sie Driver Assist. Klicken Sie auf den Karteireiter Startseite und klicken Sie auf "Hilfe" im unteren linken Bereich des Bildschirms. Nachdem Sie darauf geklickt haben, öffnet sich das Kundenportal von Driver Assist in Ihrem Browser. Sie können uns entweder per E-Mail oder per Chat kontaktieren. Falls Sie sich für den Kundenservice per E-Mail entscheiden, geben Sie bitte alle benötigten Informationen ein (1) und klicken Sie auf den grünen Button "Ticket absenden" (2), um ein Kundenservice-Ticket zu eröffnen. Eine Antwort erhalten Sie innerhalb von 24 Stunden. Für sofortigen Kundenservice klicken Sie bitte auf den grünen Button "Jetzt live chatten" im rechten unteren Bereich der Seite. Sie sollten innerhalb von einer Minute, nachdem Sie Ihre erste Anfrage versandt haben, eine Antwort erhalten. Apri DriverAssist. Clicca sulla scheda Home e poi clicca sul pulsante Guida, nella parte in basso a sinistra dello schermo. Cliccando su Guida si aprirà direttamente, sul tuo internet browser, il portale clienti di Driver Assist. Potrai scegliere se contattarci via e-mail o via chat. Per l'assistenza via e-mail, ti preghiamo d'inserire tutte le informazioni necessarie richieste (1) e cliccare sul pulsante verde Invia Ticket (2), per creare automaticamente un ticket di supporto. T'invieremo una risposta entro 24 ore. Per un'assistenza immediata, ti preghiamo di cliccare sul pulsante verde Inizia Live Chat (3), situato nella parte in basso a destra della pagina. Dovresti ricevere una risposta entro un minuto dopo che avrai inviato la tua prima richiesta. Как Мне Обратиться в Службу Поддержки? Запустите Driver Assist. Щелкните на вкладке «Главная», а затем нажмите кнопку Справка/Помощь в нижней левой части экрана, что откроет портал обслуживания клиентов Driver Assist в Вашем интернет-браузере. Вы можете связаться с нами через электронную почту или чат. Для поддержки по электронной почте, пожалуйста, введите все необходимые сведения (1) и нажмите зеленую кнопку Отравить Запрос (2), чтобы автоматически обратиться в службу поддержки. Ожидайте ответа в течение 24 часов. Для немедленной поддержки, пожалуйста, нажмите на зеленую кнопку Живой Чат (3), расположенную в нижней правой части страницы. Вы должны получить ответ в течение минуты. Inicie DriverAssist. Haga clic en la ficha Inicio y luego haga clic en el botón Ayuda situado en la parte inferior izquierda de la pantalla. Al hacer clic en Ayuda se abrirá directamente el DriverAssist Portal del cliente en su navegador de Internet. Usted puede optar por ponerse en contacto con nosotros a través de correo electrónico o chat. Para Apoyo por Email , introduzca toda la información necesaria (1) y haga clic en el botón verde Entrega (2) para crear automáticamente un ticket de soporte. Usted recibira una respuesta dentro de 24 horas. Para obtener asistencia inmediata, por favor haga clic en el botón verde de Chat en Vivo Ahora (3) situado en la parte inferior derecha de la página. Usted debe recibir una respuesta dentro de los primeros minutos, después de enviar su primera consulta. Abra o DriverAssist. Clique na guia Início, em seguida, clique no botão Ajuda na parte inferior esquerda da tela. Clicando em Ajuda irá abrir diretamente o Portal do Cliente de Driver Assist no seu navegador de internet. Você pode optar por entrar em contato conosco pelo e-mail ou chat. Para enviar um email ao suporte, gentilmente inserir todas as informações necessárias (1) e clique no botão verde Enviar Ticket (2) para criar automaticamente um ticket de suporte. Esperar uma resposta dentro de 24 horas. Para suporte imediato, por favor clique no botão verde Live Chat Agora (3) localizado no lado inferior direito da página. Você deverá receber uma resposta no primeiro minuto, depois que você enviou a sua primeira consulta. Hoe kan ik een DriverAssist Licentie aanschaffen? Na het installeren van DriverAssist, zal u worden gevraagd uw computer te scannen voor driver fouten, gevolgd door een prompt om de software te registreren. Klik op de groene Registreer Nu knop. U ziet dan een pagina waar u gevraagd wordt een formulier in te vullen: Volledige Naam (1), Email (2) en Land (3). Alleen de eerste 2 zijn verplichte velden. Daarna, klik op de groene Activeer Nu knop. Klik op de vervolgkeuzepijl (1) en kies het door u gewenste abonnement: Standaard (6 maanden) of Verlengd (1 jaar). U heeft ook de mogelijkheid om het te bundelen met Safebytes Anti-Virus door te klikken op de tick-box (2). Ten slotte kiest u de gewenste betaalmethode: Krediet Kaart (3) of PayPal (4) om door te gaan met de aankoop. Comment puis-je faire l’acquisition d’une licence pour DriverAssist ? Après avoir installé Driver Assist, vous serez invité(e) à analyser votre ordinateur afin de rechercher des erreurs, puis il vous sera demandé d'enregistrer le logiciel. Cliquez sur le bouton vert Enregistrez-vous maintenant. Vous devriez apercevoir une page vous demandant de remplir un formulaire : Nom complet (1), Adresse de courriel (2) et Pays (3). Seuls les deux premiers champs sont obligatoires. Après cela, il vous suffit juste de cliquer sur le bouton vert Activer Maintenant. Cliquez sur la flèche déroulante (1) et choisissez le type d'abonnement que vous souhaitez : standard (6 mois) ou prolongé (1 an). Vous pouvez également combiner cette offre à l'antivirus de Safebytes en cliquant sur la case à cocher (2). Et enfin, choisissez votre méthode de paiement : carte de crédit (3) ou Paypal (4) afin de procéder à l'achat. Wie kann ich eine Driver Assist Lizenz kaufen? Nachdem Sie DriverAssist installiert haben, werden Sie aufgefordert, Ihren Computer nach Treiberfehlern zu durchsuchen. Danach sehen Sie eine Aufforderung, die Software zu registrieren. Klicken Sie auf den grünen Button "Jetzt registrieren". Sie sollten jetzt eine Seite sehen, auf der Sie gebeten werden, ein Formular auszufüllen: Vor- und Nachname (1), E-Mail (2) und Land (3). Nur die ersten beiden Felder sind Pflichtfelder. Klicken Sie danach auf den grünen Button "Jetzt aktivieren". Klicken Sie auf den Pfeil des Auswahlmenüs (1) und wählen Sie Ihr bevorzugtes Abonnement: Standard (6 Monate) oder Erweitert (1 Jahr). Sie haben auch die Möglichkeit, das Programm mit Safebytes Anti-Virus zu kombinieren, indem Sie das Kontrollkästchen aktivieren (2). Wählen Sie schließlich Ihre bevorzugte Zahlungsmethode: Kreditkarte (3) oder PayPal (4), um mit dem Kauf fortzufahren. Come posso acquistare una licenza DriverAssist? Dopo aver installato DriverAssist, ti sarà richiesto di eseguire la scansione del tuo computer per errori di driver, seguita dalla richiesta di registrazione del software. Clicca sul pulsante verde Registrati ora. Ora dovresti vedere una pagina che ti chiede di compilare un modulo: Nome e cognome (1), E-mail (2) e Nazione (3). Solo i primi 2 sono requisiti obbligatori. Al termine, dovrai solo cliccare sul pulsante verde Attiva ora. Clicca sulla freccia a discesa (1) e scegli il tuo abbonamento preferito: standard (6 mesi) o prolungato (1 anno). Hai anche l'opzione di abbinarlo all'Anti-Virus di Safebytes, cliccando sull'apposita casella (2). Infine, scegli il tuo metodo di pagamento preferito: Carta di credito (3) o PayPal (4) per procedere con l'acquisto. Как я могу приобрести лицензию DriverAssist? После установки DriverAssist Вам будет предложено проверить компьютер на ошибки драйверов с последующей регистрацией продукта. Нажмите на зеленую кнопку "Зарегистрировать сейчас". Вы должны увидеть страницу с формой для заполнения: ФИО (1), email (2) и страна (3). Только первые 2 поля обязательны. Заполнив форму, нажмите на зеленую кнопку «Активировать сейчас». Щелкните стрелку раскрывающегося списка (1) и выберите желаемую подписку: Стандартная (6 месяцев) или Расширенная (1 год). Вы также можете заказать Антивирус Safebytes, отметив его галочкой (2). И, наконец, выберите предпочтительный способ оплаты: кредитная карта (3) или PayPal (4). ¿Cómo puedo adquirir una licencia de DriverAssist? Después de la instalación del DriverAssist, se le pedirá a escanear su ordenador para errores del driver, seguido de un mensaje para registrar el software. Haga clic en el botón verde Registrar ahora. Usted debe ver una página que le pide que rellene un formulario: Nombre completo (1), correo electrónico (2) y Pais (3). Sólo las primeras 2 son requisitos obligatorios. Después de eso, simplemente haga clic en el botón verde Activar ahora. Haga clic en la flecha hacia abajo (1) y elija su suscripción preferido: Estándar (6 meses) o prolongada (1 año). Usted también tiene la opción para empaquetarlo con Safebytes Anti-Virus, haga clic en la casilla de verificación (2). Por último, elige la forma de pago: Tarjeta de crédito (3) o PayPal (4) para proceder con la compra. Como posso adquirir uma Licença de DriverAssist? Depois de instalar o DriverAssist, você será solicitado a analisar o seu computador para erros de driver, seguido por uma solicitação para registrar o software. Clique no botão verde Registrar Agora. Você deverá ver uma página pedindo para você preencher um formulário: (1)Nome completo (2), e-mail (3) e País . Apenas os 2 primeiros são requisitos obrigatórios. Depois disso, basta clicar sobre o botão verde Ativar agora. (1)Clique na seta para baixo e escolha a inscrição da sua preferência: Padrão (6 meses) ou Extendida (1 ano). (2)Você também tem a opção de empacotá-la com o Anti-Virus SafeBytes, marcando na caixa de opção. Por último, escolher o seu método preferido de pagamento: (3)Cartão de crédito ou (4)PayPal para prosseguir com a compra. Hoe kan ik zien of mijn software geactiveerd is? Lanceer DriverAssist van het Startmenu of via de snelkoppeling op uw Bureaublad. Zodra het hoofd toepassing scherm is geopend, klikt u op de Licentie (1) tabblad in het bovenste menu paneel. Je moet het woord Geregistreerd (2 & 3) te zien. De Gebruiker ID (4) en de licentiecode (5) zal ook op deze pagina worden weergegeven. Net onder de code is de Vervaldatum. De geregistreerde naam en e-mail (6) zal te zien zijn in de linkerbenedenhoek van de pagina. Comment puis-je voir si ma copie du logiciel a été activée ? Lancez DriverAssist depuis le menu Démarrer ou son icône de bureau. Une fois que l'écran principal de l'application est ouvert, cliquez sur l'onglet licence (1) figurant sur le menu du haut. Vous devriez apercevoir le mot Enregistré (2 & 3). L'ID utilisateur (4) et la clé de licence (5) sont aussi affichés sur cette page. Au-dessous de la clé se trouve la date d'expiration. Le nom et l'adresse de courriel enregistrés (6) se trouvent en bas à gauche de cette page. Wie kann ich kontrollieren, ob meine Software aktiviert ist? Starten Sie DriverAssist über das Startmenü oder das Desktop-Symbol. Sobald sich der Hauptbildschirm der Anwendung öffnet, klicken Sie auf den Karteireiter Lizenz (1) im oberen Menü. Sie sollten jetzt das Wort "Registriert" sehen (2 & 3). Die Benutzer-ID (4) und der Lizenzschlüssel (5) werden ebenfalls auf dieser Seite angezeigt. Direkt unter dem Schlüssel finden Sie das Ablaufdatum. Der registrierte Name und die E-Mail Adresse (6) befinden sich im unteren linken Bereich der Seite. Come faccio a sapere se il mio software è stato attivato? Apri DriverAssist dal menu "Start" o dal collegamento sul desktop. Una volta che la schermata principale è aperta, clicca sulla scheda di Licenza (1) dal menu in alto. Dovresti vedere la parola Registrato (2 e 3). L'ID utente (4) e la chiave di licenza (5) saranno, a loro volta, visualizzate su questa pagina. Subito sotto la chiave si trova la Scadenza. Il nome registrato e l'e-mail (6) saranno nella parte in basso a sinistra della pagina. Как понять, что моя программа активирована? Запустите Driver Assist из меню "Пуск" или щелкнув по ярлыку на рабочем столе. После открытия главного экрана программы, щелкните по вкладке лицензии (1) в верхнем меню. Вы должны увидеть слово Зарегистрировано (2 и 3). ID Пользователя (4) и лицензионный ключ (5) также должны быть отображены на этой странице. Чуть ниже указан срок окончания подписки. Зарегистрированное Имя и Email (6) будут указаны в нижней левой части страницы. ¿Cómo puedo ver si el software está activado? Inicie DriverAssist desde el Menú de Inicio o el acceso directo del escritorio. Una vez que la pantalla principal de la aplicación está abierta, haga clic en la ficha de la licencia (1) desde el panel de menú superior. Usted debe ver la palabra Registrada (2 y 3). El ID de usuario (4) y la clave Licencia (5) también aparecerán en esta página. Justo debajo de la clave es la Expiración. El nombre registrado y correo electrónico (6) estarán en la parte inferior izquierda de la página. Como posso ver se o meu software está ativado? Abra o programa DriveAssist no menu Iniciar ou no atalho da área de trabalho. Quando a tela principal da aplicação abrir, (1)clique na guia de Licenças no painel do menu superior. (2 e 3)Você deverá ver a palavra Registrado. O ID do usuário (4) e a chave de licença também serão exibidos nesta página. (5)Logo abaixo da chave está a validade. (6)O nome registrado e o email estará na parte inferior esquerda da página. Comment puis-je désinstaller DriverAssist ? Wie kann ich Driver Assist deinstallieren? Van het hoofdvenster onder de Download pagina, klik op de groene knop Download Safebytes DriverAssist. Wanneer u wordt gevraagd, selecteert u de Bestand opslaan of opslaan op schijf optie in het dialoogvenster. Noteer de locatie waar het bestand wordt opgeslagen. Zodra de download is voltooid, zoekt u het gedownloade bestand en dubbelklikt erop om de installatieprocedure te starten. Volg de instructies op het scherm om DriverAssist te installeren: Klik op Volgende om door te gaan. Lees de licentieovereenkomst voor eindgebruikers en klik op Ik Stem Toe om door te gaan of klik op Terug om naar het vorige scherm te gaan. Klik op Voltooien om de installatie te voltooien en start DriverAssist op uw computer. Comment puis-je installer DriverAssist ? Depuis la fenêtre principale, sur la page de téléchargement, cliquez sur le bouton vert Télécharger DriverAssist de Safebytes. Lorsque vous y êtes invité(e), sélectionnez l'option de la boîte de dialogue Enregistrer le fichier sur le disque. Notez l'emplacement dans lequel ce fichier est sauvegardé. Une fois le téléchargement terminé, localisez le fichier téléchargé et double-cliquez sur celui-ci afin de lancer la procédure d'installation. Suivez les instructions se présentant à l'écran afin d'installer DriverAssist : Cliquez sur Suivant pour continuer. Lisez entièrement le contrat de licence de l'utilisateur final et puis cliquez sur J'accepte afin de continuer, ou bien sur retour afin de revenir à l'écran précédant. Cliquez sur terminer pour mettre fin à l'installation et lancer DriverAssist sur votre ordinateur. Klicken Sie im Hauptfenster der Download-Seite auf die grüne Schaltfläche "Safebytes DriverAssist herunterladen". Nachdem Sie dazu aufgefordert werden, wählen Sie im Dialogfeld "Datei speichern" oder "Auf Festplatte speichern". Achten Sie auf den Ort, an dem die Datei gespeichert wird. Sobald der Download abgeschlossen ist, suchen Sie die heruntergeladene Datei und klicken Sie doppelt darauf, um die Installation zu starten. Befolgen Sie die Anweisungen auf dem Bildschirm, um DriverAssist zu installieren: Klicken Sie auf Weiter, um fortzufahren. Lesen Sie sich die Endbenutzer-Lizenzvereinbarung durch und klicken Sie danach auf "Ich stimme zu", um fortzufahren. Klicken Sie "Zurück", um zum vorhergehenden Bildschirm zurückzukehren. Klicken Sie auf Fertigstellen, um die Installation abzuschließen und DriverAssist auf Ihrem Computer zu starten. Dalla schermata principale, sotto la pagina di download, clicca sul pulsante verde Download Safebytes DriverAssist. Quando richiesto, scegli l'opzione Salva file o Salva su disco nella finestra di dialogo. Prendi nota della posizione, dove il file viene salvato. Una volta completato il download, individua il file scaricato e con un doppio clic dai inizio alla procedura d'installazione. Segui le istruzioni a schermo per installare DriverAssist: Clicca Avanti per continuare. Leggi l'accordo di licenza con l'utente finale e poi clicca Accetto per continuare o Indietro per tornare alla schermata precedente. Clicca Fine per completare l'installazione e avviare il DriverAssist sul tuo computer. В главном окне на странице Загрузки нажмите на зеленую кнопку Скачать Safebytes DriverAssist. При появлении запроса выберите пункт Сохранить файл или Сохранить на диск. Укажите место для сохранения файла. По завершению загрузки найдите файл и дважды щелкните по нему, чтобы начать установку. Следуйте инструкциям на экране для установки DriverAssist на Вашем компьютере. 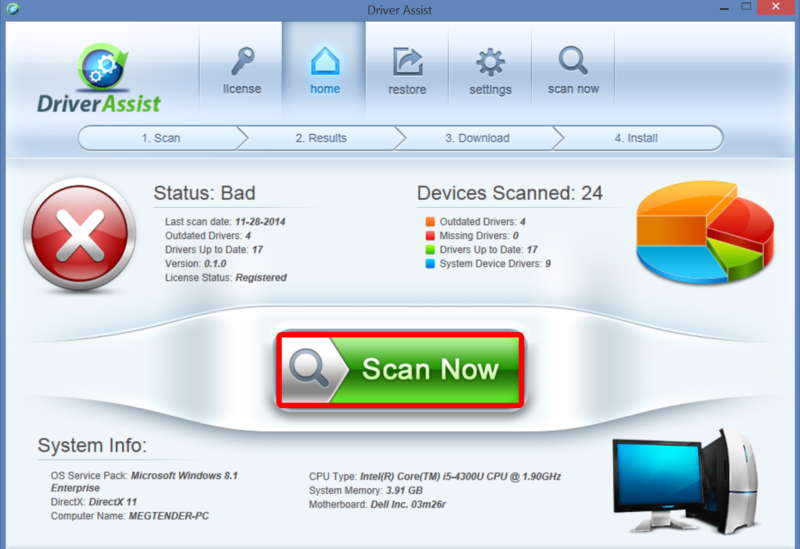 Desde la ventana principal, en la página de descarga, haga clic en el botón verde Descargar Safebytes DriverAssist. Cuando se le indique, seleccione la opción Guardar archivo o Guardar en disco en el cuadro de diálogo. Tome nota de la ubicación donde el archivo se está guardando. Cuando la Descarga esta completo, busque el archivo descargado y haga doble clic en él para iniciar el procedimiento de instalación. Siga las instrucciones en pantalla para instalar DriverAssist: Haga clic en Siguiente para continuar. Lea el acuerdo de licencia de usuario final y haga clic en Acepto para continuar o en Atrás para ir a la pantalla anterior. Haga clic en Finalizar para completar la instalación y inicia DriverAssist en su ordenador. Como faço para instalar Driver Assist? Na janela principal, sob a página de download, clique no botão verde Baixar Safebytes DriverAssist. Quando solicitado, selecione a opção Salvar arquivo ou salvar para o disco na caixa de diálogo. Anote o local onde o arquivo está sendo salvo. Uma vez que o download estiver concluído, localize o arquivo baixado e clique duas vezes nele para iniciar o procedimento de instalação. Siga as instruções na tela para instalar o DriverAssist: Clique em Avançar para continuar. Leia o acordo de licença do usuário final e, em seguida, clique em Concordo para continuar ou clique em Voltar para ir para a tela anterior. Clique em Concluir para completar a instalação e iniciar DriverAssist no seu computador.